The EntreAssess consortium consists of six institutions from four European countries. Our partners complement each other by bringing together universities (with connections to schools on different levels), training establishments also with close connections to schools and in-service training, a VET school with long experience of entrepreneurial learning and an IT company experienced in evaluating entrepreneurship education (EE) with online tools. All of our partners are involved in cutting edge projects to evolve EE and assessment which will help us cater to the needs of modern educators. Each partner includes staff that have written and researched on the subject of assessment in entrepreneurship education, and are considered experts in the field. The University of Iceland (UI) is a leading specialist in EE and has done extensive research in the area. They provide expertise in training teachers and have good connections with schools at all levels. Founded in 1911, the university has grown to a modern comprehensive university, providing instruction for 14,000 students in twenty-five faculties. Teaching and research is conducted in social sciences, humanities, medicine, natural sciences, engineering and teacher education. e professions the school educates, such as schools and other societal institutions. At the SoI diverse research is carried out in the fields of education, pedagogy and training, for the purpose of creating new knowledge for the benefit of Icelandic society. Academic programmes at the School of Education are offered in three modes: on-site, as distance education or as flexible education. The University of Iceland has participated in numerous projects under the 6th Framework Programme and in 53 projects under 7th Framework Programme, both as a coordinator and as a project partner. 17 of these projects are Marie Curie projects, either ITNs or Individual fellowships. The SoI has participated in several European projects some focused on EE such as: InnoEd, SEET and ADEPTT. In addition to EntreAssess, SoI is currently taking part in SOCENT (Social Innovation), FYII (Find your inner inventor) and MakEy (Makerspaces in the early years: Enhancing digital literacy and creativity). As Coordinator, the University of Iceland will lead on project management and the project website as learning centre. RG Menntaráðgjöf slf was established in 2014 in Iceland to handle consultancy work as well as research and development in the field of Innovation Education and Entrepreneurship Education, both in Iceland and abroad. RG Mennt is involved mostly in work with private educational institutions in the Middle East and some in the Far East, and on national level with government projects, research and training. On European level, RG Mennt participates in select number of projects on the progression of Innovation Education and Entrepreneurship Education where the focus is on realising the practicalities of policy with actual participation of learners. RG Menntaráðgjöf slf will oversee data collection, analysis and the write-up of the report of the small scale study on teachers’ perceptions. They will also lead on dissemination and exploitation of the project. RG Consultancy will work together with Bantani Education asbl on their tasks. Bantani Education is a non-profit based in Belgium, working collaboratively to drive entrepreneurial and creative learning. By bringing together policy and practical experience, Bantani work with public, community and private sector partners to embed entrepreneurial skills into any type of learning. Their co-founders and network of associates work to build collaborations and initiatives involving policy makers, educators, community and the private sector, to embed high quality entrepreneurial and creative learning practice and policy into formal and non-formal learning. Bantani is the Welsh for ‘Away We Go’. The University of Wales Trinity Saint David (UWTSD) was formed in 2010 through the merger of the University of Wales Lampeter and Trinity University College Carmarthen, under Lampeter’s Royal Charter of 1828. In 2013, Swansea Metropolitan University became part of UWTSD. The UWTSD Group has over 25,000 learners across 17 campuses in rural and city locations. Together they deliver benefits for learners, employers, industry and communities by offering a vocational approach from entry level to post-doctoral research. UWTSD has a clear strategic plan which places emphasis upon applied learning, strong academic disciplines, including Engineering, Art and Design, Built and Natural Environment, Archaeology and Social Sciences and Humanities, and a clear commitment to innovation, enterprise and knowledge transfer. This connected university is driving through structural and strategic change which is closely associated with industry, business and enterprise. The University has a clear national profile – delivering for Wales and celebrating its distinctiveness on a UK and international stage. UWTSD, as a teacher training institution, is an acknowledged leader in the field of ‘training the trainers’ for entrepreneurship education, having the UK’s first accredited training program, developed in collaboration with and funded by the Welsh Government. This module was chosen to include as a best practice case study by the Higher Education Academy (2015). 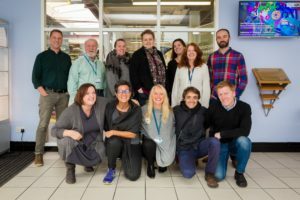 UWTSD students and staff participate in Tech Hub activities and they help UWTSD to develop their entrepreneurial curriculum by sharing their ideas. Within the EntreAssess project, UWTSD oversees the gathering and writing up of the progression model for assessment in EE that will capture lessons learned and potential applications. Valnalon (Ciudad Industrial del Valle del Nalón) was created by the Department for Industry and Labour of the Government of the Principality of Asturias, Spain, in 1987. Its goal was to design and implement a plan to regenerate, promote and dynamise a former industrial area in the Nalon River Valley. This plan has evolved, shifting the focus from the development of infrastructures to a firm commitment to develop entrepreneurship in order to change mindsets, facilitating the transition from the industrial age to a more entrepreneurial society. Valnalon have developed and tested a robust method to assess and monitor the development of entrepreneurial competences of the users of their business incubator. However they still seek suitable assessment tools in education, to integrate the assessment of the entrepreneurial key competence ‘sense of initiative and entrepreneurship’ into the education system which is their drive to make EntreAssess a successful project. Valnalon will lead on the project’s quality and evaluation and be involved in communications. They will also monitor progress and evaluate the impact of the project throughout the project lifecycle. San Jose de Calasanz school began its activity in 1969 and during the academic year 1975-76 began teaching in Vocational Training. Today, San José de Calasanz offers education for infants, as well as primary education, middle and higher education to VET in the areas of administration, commerce and marketing, and health and community. The school’s administration track in public service is strongly linked to the municipality of Santurtzi and works in effective collaboration with agencies and companies in Basque Country. The school’s purpose is to satisfy the requirements, expectations and needs of their current and potential interest groups, offering an education that favours the integral development of students. They work to be an innovative educational centre open to society, dynamic and forward-looking, and recognised for their capacity for innovation, both in methodologies and techniques that enable students to acquire the competences ​​necessary to enter the job market and to successfully meet the challenges of a changing social reality. San José de Calasanz have developed a robust mechanism to assess the entrepreneurial competency of VET students and see EntreAssess as an opportunity to upgrade and extend their current approach to lower levels of education (primary and secondary). They will be a case study for EE assessment at transition points as well as coordinate action planning (final Peer Learning Activity). Me Analytics is a Swedish IT developer who has experience implementing and assessing entrepreneurial education both on behalf of the Swedish Government and also through ELAN, an ongoing transnational project on entrepreneurial assessment. They use an innovative IT system, LoopMe, to identify and assess progress of project participants. LoopMe integrates the latest research on learning with school and work-life practice. The result is an easy-to-use tool that quickly and precisely follows and deepens learning and development. The research behind LoopMe has been conducted at Chalmers University of Technology and has primarily been focused on highlighting cause and effect relationships in learning processes: What is crucial in a training / development efforts in order to make learning and development really happen for large groups of people? LoopMe has also been used in research for impact studies on effects of different education initiatives. Today LoopMe is used by schools, colleges and organisations around the world. Me Analytics will coordinate the compilation of tools, practices, initiatives and case studies in the project.